This post is brought to you by ColorbookIt.com. Universally, coloring books can be seen as a passion for all children. They're a inexpensive way to involve the greatest creativity that envelopes the imagination of your little one. Whether it's an image of their favorite character, or simple shapes matched with their favorite color, hours can be spent creating works of art akin to those of Van Gough, each shared with pride deeper than the most fanatic NFL follower. One twist that's little seen with coloring books is what happens when you add your personal touch to them. Instead of a coloring page of Iron Man, watch your kid's eyes light up when they color in pages of their last birthday party. What if you could see the excitement of they coloring in their winning soccer goal from last fall. Or, perhaps, running for the crayons to color in faces of their grandparents. 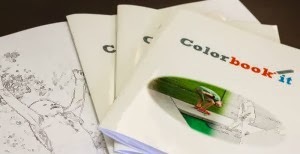 Although this isn't something you will ever find off the shelves at your local craft store, these coloring books are something you can create at ColorbookIt.com. ColorbookIt.com lets you transform your favorite pictures into your kid's favorite coloring books. Download digital prints, or order professionally printed and bound copies, you too can see the excitement personalized coloring books can bring to your child's activity time.